Tag Archive | "Rockford Historical Museum"
The Cedar Springs Historical Museum recently provided a “Visitation Open House” for the Rockford Historical Museum Board of Directors and about 40 of their volunteer workers and friends. 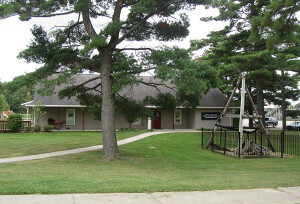 The meeting took place on the evening of April 7, from 7 to 9:30 p.m. at the Cedar Springs Historical Museum. The visitors were welcomed by Cedar’s Museum Director Sharon Jett, and several other Cedar board members. Refreshments were served and tours around the museum were provided by members Tanya Eldred, Sally Grayvold, Nancy Star, and Sharon Nielsen. D.M. White provided general information about the museum overall, as well as an extensive talk about our railroad display. Terry Konkle, president of the Rockford Museum, gave an interesting presentation about what is happening at their new museum site, located in the old 63rd District Court building, in downtown Rockford. He indicated that they have now been at their new site for about three years. He spoke to me as his counterpart here at Cedar to ask about our ability to provide such a well organized and outstanding display of artifacts. I assured him many hands have taken part in the acquisitions of the historic items we have, and we have outstanding leadership from our directors Sharon Jett and Tanya Eldred. We also have a dedicated staff of board members who have provided many hours of work pulling what we have here together. At any rate, a good time was had by all. I believe these events tend to bring communities together. The Cedar Springs Historical Museum is open on Wednesdays from 10 a.m. to 5 p.m. On Saturday, April 30 and Sunday, May 1, they will be open from 11 a.m. to 5 p.m., along with other museums in the Tri-River Historical Museum network.